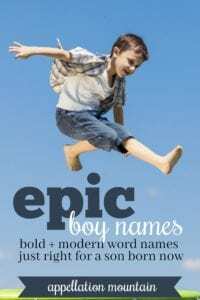 What makes epic boy names? They’re big and bold. The meanings leap off the page, carry when you call the name. We expect epic boy names to belong to all-star athletes. Action heroes. World changers of every kind. There’s no room to hide with these choices. Wolf, Fox, and Bear feel epic – but they’re also nature names. Others, like Wilder and Pierce, count as surnames, which makes them preppy hellraisers – equal parts fierce and buttoned-down. And lastly, a few – think of Messiah or Journey – carry spiritual overtones that soften them, or, like Justice or Valor, might read as modern virtue name choices instead. Most often, epic boy names come straight from the pages of the dictionary, words with powerful images attached. The drawback? Epic boy names might feel like much too much for any mere mortal to wear. And yet, many of these names appear in the current US Top 1000. That means that they’ve gone mainstream – and, inevitably, feel far less surprising than they might have in 1918 … or even 2008. In tennis, an ace is an aggressive serve that scores a point. Especially effective fighter pilots are known as flying aces. And if you’ve got an ace up your sleeve, you have a hidden advantage you’ve yet to reveal. That leads to the name’s image: a little bit lucky, and a whole lot skilled, with a certain amount of bravado thrown in. Unlike many of these names, Ace claims a little bit of backstory, long before Ace Frehley co-founded Kiss and Jim Carrey played pet detective Ace Ventura. Saintly Blaise has been around for eons. But fiery Blaze? That’s a new one, seldom heard in the US prior to the twenty-first century. But today, it’s the ‘z’ spelling that ranks far higher than the original, and it’s possible that many parents are unaware of the ‘s’ version when they choose this one for their children. It’s exactly right as a stage name for heavy metal singer Blaze Bayley; it works every bit as well for the bright red truck in Nickelodeon’s animated series Blaze and the Monster Machines. But it’s increasingly heard on real kids, too, like Kate Winslet’s son, Bear Blaze. I’ve yet to write about Blaze, but you can read about Blaise here. As a surname, Cannon comes from our word canon, a church official, ultimately from a Greek word meaning rule or standard. But double the n and Cannon is a weapon, this time from a Latin word meaning tube. They’re big ol’ guns, mounted on ships and rolled onto battlefields on wagon wheels. In other words? They’ve got serious power. That’s what the name connotes today, a kind of force. And yet, there’s something carefree about Cannon, too – maybe that’s because we cannonball into the water, and circus daredevils have been human cannonballs since the 1870s. I’ve yet to write about Cannon, but check back and I’ll update when I do. Jett debuted in the US Top 1000 in 1999, but you can find the name in use far earlier. James Dean played Jett in 1956’s Giant. Today it brings to mind the wild blue yonder. It also signals speed, since they’re much faster than airplanes that came before. As it happens, the surname has nothing to do with flight or anything like that – but odds are that the average parent of a Jett today is dreaming of adventure. A boy named King is born to rule. Unlike many of the names on this list, it has a history of use tracing back into the 1800s. That’s probably because it’s been a surname for ages, often bestowed upon someone who worked in a palace. Some children may have been named to honor Dr. Martin Luther King, Jr. 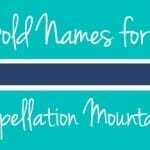 But the name has spiked in popularity over the past decade, doubling in use, and then doubling again. Similar names, like Kingsley and Kingston, appear in the Top 1000, too, but they’re slightly more subtle. It’s King that belongs with the epic boy names. Declaring your child a legend at birth seems a little premature, doesn’t it? Typically, a legend earns that status by achievement. But frame it another way, and the name contains a parent’s wish that her child will accomplish remarkable things. The name took off following Will Smith’s 2007 movie I Am Legend … though his character was called Robert. I’ve yet to write about Legend, but check back and I’ll update when I do. Major might be a title, or it might be a way of announcing that your child is pretty great. You might have a Major on your family tree – even if it sounds modern, title names had a good run a hundred years ago, and this one lingered in the US Top 1000 into the early 1970s. Today, though, it seems more likely to convey greatness – think of phrases like major league, major motion picture, and so on. It also fits with two-syllable, ends-in-r boy names like Carter and Parker, so maybe that’s part of the name’s appeal today. I’ve yet to write about Major, but check back and I’ll update when I do. Not so long ago, I dismissed Maverick as too big a name to bestow. What if you named your kid Maverick and he was shy? Or bookish? Or anything other than the uber-confident flyboy that a young Tom Cruise made legendary in 1986’s Top Gun? But here’s what happened: lots of people ignored me. They liked Maverick’s sound. The ties to sports (as in the Dallas Mavericks) and all things Western (from the old-school television series to the Texas land baron who refused to brand his cattle). And the sense of a Maverick as a strong-willed individual. So Maverick became an aspirational choice, and the most popular of the epic boy names. Read more about Maverick here. Some parents might love Phoenix because it’s a place name, but I’m guessing the name resonates even more as a symbol. In Greek mythology, a phoenix is a bird that rises from its own ashes. There’s a similar creature in Egyptian myth, and various re-tellings of the story have traveled around the world. It’s sometimes associated with Christian ideas about resurrection. One of the Harry Potter plot-lines hinges on a phoenix named Fawkes. So that’s a lot of potential meaning behind this fiery name, enough to put it in the company of epic boy names. Plenty of R names could appear on this list: Rebel, Racer, Rogue, and Rascal, just to name a few. But I think the spot belongs to Rocket. When musician Pharrell first explained his son’s name in an interview with Oprah, he talked about how rockets are meant to ascend. He viewed it as a modern equivalent of a nature name, one encouraging achievement. It changed my opinion of the name instantly. 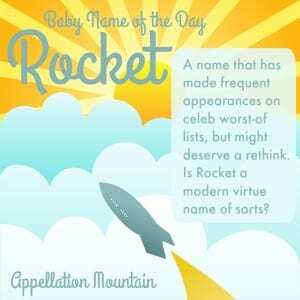 Though it still fits with epic boy names, because unlike a rugged nature-inspired choice, Rocket still conveys power and speed. Read more about Rocket here. Titan almost belongs with mythological names, like Apollo and Zeus. Except, Titan isn’t a person – it’s a class of gods, the first generation of Greek deities. Only many centuries later did comics give us a few heroes and villains by the name. Since the early nineteenth century, we’ve used Titan to refer to a giant in a particular field – an accomplished athlete, a powerful business exec. By the late 1970s, we saw a very few boys given Titan as a name. The trend continues to accelerate, with Titan falling somewhere between Tyler and Cannon, a bold choice, but not a truly unusual one any more. These are my picks for epic boy names. Would you consider any of these? Or do you think they’re tough to wear? And tell me what you would add to this list – I feel like I’m missing a bunch! Maverick is our pick for our next boy. We have a Sterling and a Lyra currently. I’m waiting for people to start using Wallace as the long version of Ace, instead of just Axel. I love Wallace, but I’m not sure we’re ready for a return of Wally just yet. I can’t get on board with Major, because I just think Minor whenever I hear it, and then I think, “How are you going to modulate that chord?” In essence, it doesn’t feel tough and masculine at all–just artsy. Cannon feels the same way–I just think Canon in D.
I have gotten so used to Phoenix I don’t think of it as an “epic name” anymore. 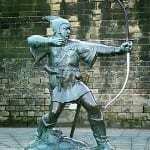 Years ago the mythological creature was my first association – now I think of it as more of a place name. I suppose the more you are exposed to a name the less you associate it with real people. Maverick, Ace, and Jett are the same way for me–used so often as to have lost any real “cool” factor. The rest don’t sound like real names to me as I’ve never known anyone with those names. Canyon is pretty popular where I live, but no Cannon’s yet in our circle.